I saw how the bible was just like the Junior Woodchucks’ Guidebook in many ways. As we read in the letter to Timothy the whole bible was given to us as inspiration from God. 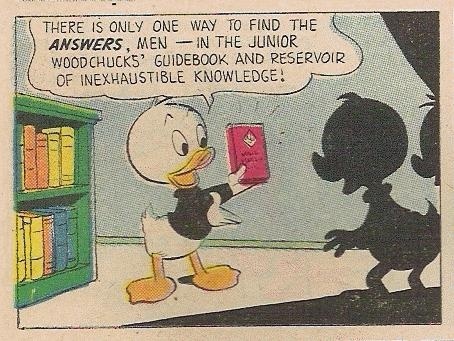 Funny thing about the Junior Woodchucks’ is that the guidebook is multiple books just like our bible and was a book that is based on books by the Guardian of the Lost Library of Alexandria. The bible is the guide book for our lives. It will help us through many situations in our lives. Just looking at the back of some bibles they have section called verses by topic you will see a litany of verses and tales from the bible that coincide on what you could need from relationships, stress, work, life, death, child rearing, etc. Something like the Junior Woodchucks’ Guidebook. But also we need to be like Junior Woodchucks. As they are quick to seek their manual of life we should be quick to seek answers for all of our situations in the bible. We need to study it so we can swiftly go the scripture we need not only to help ourselves but to help others as well. As the bible says in 2 Timothy 3:17, we must be “fully equipped to do good to everyone.” We also must not forget what is written in the Book of Joshua, “This Book of the Law shall not depart from your mouth, but you shall meditate on it day and night, so that you may be careful to do according to all that is written in it. For then you will make your way prosperous, and then you will have good success.” (ESV). So lets all be like the Junior Woodchucks. Let’s always seek guidance from the Word of God for whatever situation we may have. Our lives would probably be way easier afterwards. Heavenly Father, I am thankful that you have blessed us with your word. That Your Word has all the information that we need as Christians and as people in general. I thank You gave us our history and interwoven in our history is information that could help us be better not only for You and ourselves but for our fellow man as well. I pray Heavenly Father that you help us remember through your Holy Spirit that we need to pray to you whenever we need guidance and to read your word. I also pray that you bless us as we read with knowledge and the power that comes from it. In Jesus Name, Amen.